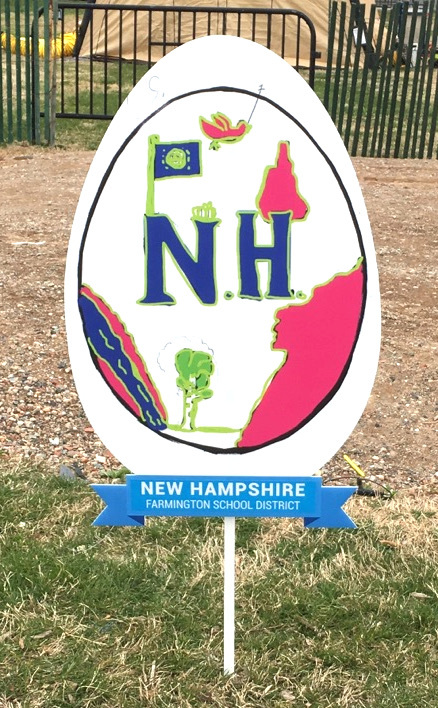 The Farmington School District had the distinct honor of representing New Hampshire at the White House Easter Egg Roll on Monday April 2. A 140 year tradition, the Easter Egg Roll, traditionally hosted by the First Lady, officially started in 1878 under President Rutherford B. Hayes. Informal festivities have origins back to the 1860s when President Lincoln hosted egg rolling parties at the White House. 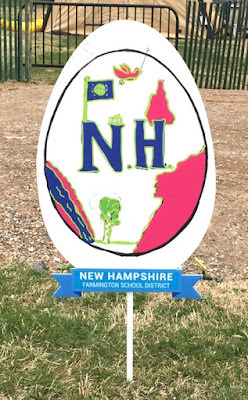 As part of the decorations for the 2018 Easter Egg Roll, each state was asked to contribute an Easter Egg design that represented their state. The state designs would be enlarged to a 2 ft by 4 ft size and the eggs would be placed on the White House South lawn for visitors and participants to admire. School Board member, Stan Freeda, who also works at the NH Department of Education as the State Educational Technology Director, worked with two Valley View Community School teachers, art teacher, Kim Smith, and technology teacher, Tom Pringle to get Farmington School District to produce a New Hampshire representative egg design. 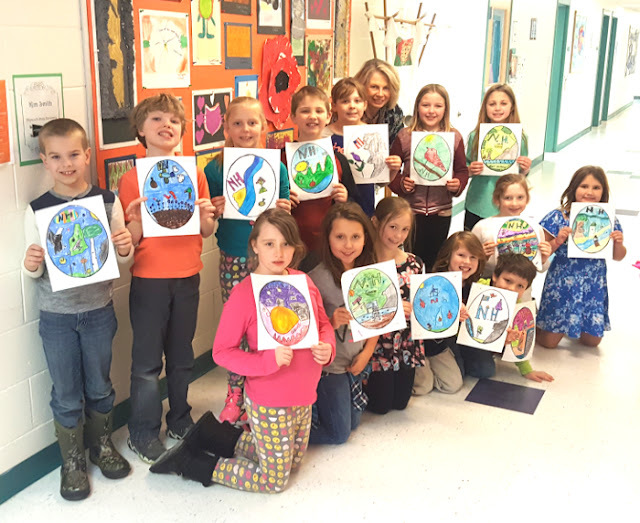 Kim and Tom worked with student Lighthouse facilitator, Cindy Hunn and Grade 3 students to create some egg designs that represented New Hampshire. The third graders designed their individual eggs and then teachers Cindy, Tom, and Kim, selected the design they felt best represented the Granite State. 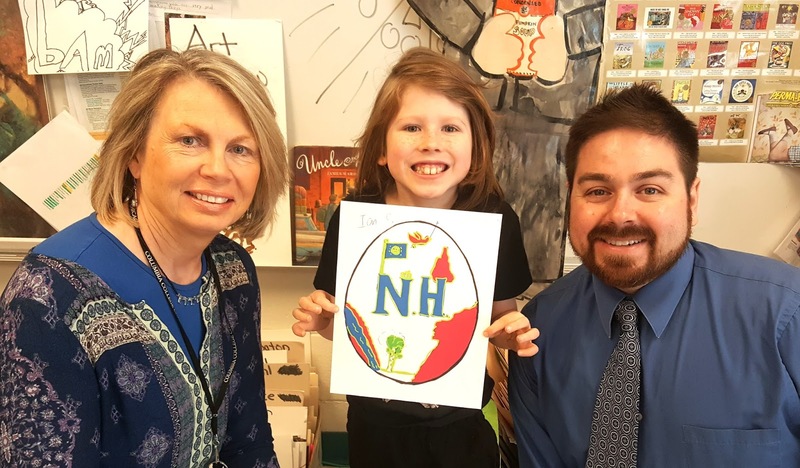 Ian Schwab, a student in 3 Pankey, created the winning egg design, a line drawing that contained many recognizable symbols of the state of New Hampshire, like the shape of the state, the New Hampshire flag, the birch tree, purple finch, and the Old Man of the Mountain. The symbols surrounded large initials, NH. Once the design was selected, Tom took the line drawing, digitized it, and converted the colors in Ian’s drawing to the required colors for the state egg decorations, along with enlarging the digitized drawing to the appropriate size for submission to representatives at the US Department of Education, who were charged with getting the representative egg designs from each state. The decorating team took the designs, mounted them on a large board display, which also featured the state name and the school district whose submission was selected. The state eggs were a perfect backdrop decorations for this year’s Egg Roll. The New Hampshire Egg on display on the White House Lawn at the Egg Roll on April 2. Valley View Art teacher, Kim Smith and Technology teacher, Tom Pringle, help student Ian Schwab display his New Hampshire Easter Egg. Find out more about the White House Easter Egg Roll.